So glad you're here today for the new designer's choice challenge at The House That Stamps Built. This month it's Shirley's turn to challenge us and her challenge is "A Way With Words". 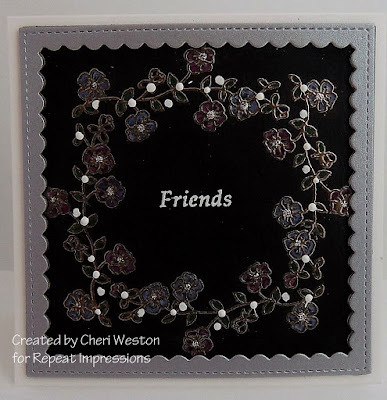 I used RI Stamp #10202 "Flower Power Frame", which I stamped with VersaMark on black cs and heat embossed with gold ep to accent my "word". The flowers were colored with my Derwent Inktense pencils. 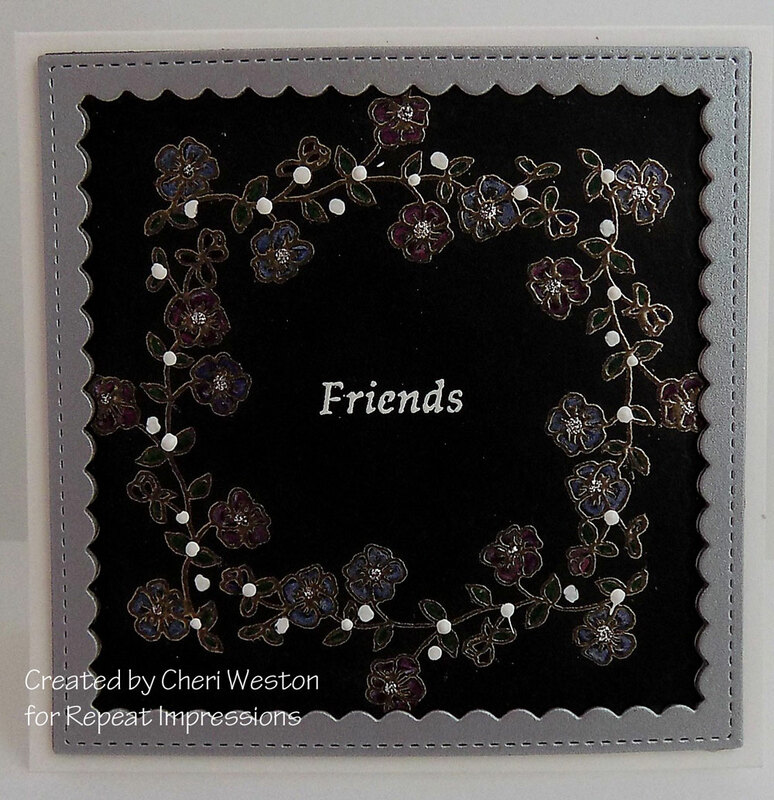 The sentiment/word is a partial stamp from RI# 3924-G "Friends Together" and also heat embossed with white ep. After framing the panel with a die cut frame, I added some white enamel dots along the vine area to bring the white accent together with my sentiment. When the card was finished I thought it looked like a rich tapestry - not what I had in mind when I started, but a pleasant surprise. Great challenge from Shirley and I hope you'll join us at The House and play along. All the details can be found there. For more fabulous ideas on Shirley's challenge, check out what fabulous projects my team mates have done. Love the way it turned out - isn't it funny how we have something in our heads when we start and it doesn't end up like we thought but we like it better??? This was a fun challenge - and our DT nailed it. Cheri, I couldn't stop staring at your lovely creation! It is wonderful. Love the embossed floral vine with the pretty enamel dots accenting it. Such an elegant looking card! Fabulous card, the flowers are so elegant and rich looking! Beautiful! I'd love to see it in real life; I bet that gold ep really pops! Love, love, love this flower wreath and how you have made it pop!